Above picture is my husband Kristian Saucier Navy Veteran sailor of 11 years. 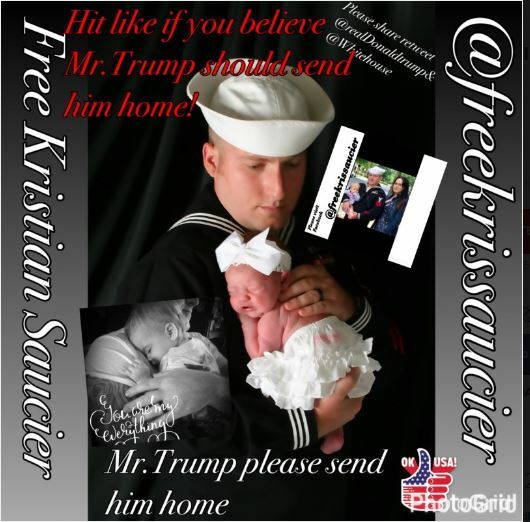 October 12,2016 he left a 17 months old and myself to serve time in Federal Prison There is a lot to the story I encourage you to visit Facebook @freekrissaucier or American Patriots Against Double Standards to understand and read. The reason for this fundraising is we have lost so much this man has worked so hard protecting our country for.My fear is that the struggles of foreclosure keeping heat on electricity food insurance. We have no health care presently as well With that there are many homeless Veterans out there and my fear is not only will we have a homeless veteran when my husband is released but a homeless Veterans family. Please share and support if you can My husband has never asked for a handout and is very proud and hard working. It is hard to beg strangers for help But pride has been pushed aside and I ask for any help for our family and please visit Facebook it’s a double standard and there are many more than just my husbands story. This article was posted in Causes and tagged Family, Hillary Clinton, Kassandra Saucier, Kristian Saucier, Navy, Navy Vet, Navy Veteran, Sadie Saucier, Support a Navy Vet, Veteran Needs Support, YouCaring.